There are a ton of conferences and events that happen throughout the year, and photography and video companies tend to make big announcements during them. Right now NAB is going on, and there have been some interesting announcements. It’s not over yet, but so far I’ve been intrigued by the Blackmagic NAB announcement. I’m pretty happy with my Sony setup, but it’s always interesting to look at new equipment with the new Blackmagic Design Pocket Cinema Camera 4K. Several years ago Blackmagic came out with the first Pocket Camera, and a good amount of people bought it. There were some issues with seeing the screen outside and battery life, but overall it was a good camera. This new Blackmagic Design Pocket Cinema Camera 4K seems to take things even further. From briefly looking at the specs, it appears this camera might be awesome! It has 4k at 60fps, 13 stops of dynamic range, and high iso. The sensor is still smaller than what I use, but there are lots of people out there using the smaller sensor and creating amazing work. I think the biggest thing that sticks out is the price. It’s only around $1,300! The other interesting announcement from Blackmagic is DaVinci Resolve 15. I’ve written a few posts about how much I love this program, and now they’ve got a newer version coming out with even more features. Before, DaVinci Resolve could do the color correction, editing, sound, and producing, but if you wanted to do any kind of motion graphics, you’d have to go to another program. Not anymore! They’ve now made it where you can do basically anything video related in one place. From what I can tell, there will still be a free version with the updates. They aren’t giving you every single thing for free, of course, but I’m still amazed at what you can do without having to pay a dime. Right now there in the Beta mode, but I’ll switch over to DaVinci Resolve 15 as soon as it releases. There are still two days left of NAB, so who knows what else will be announced. Maybe another Blackmagic NAB announcement??? For now I’m excited about the new DaVinci Resolve and interested to see what the new Blackmagic Design Pocket Cinema Camera 4K can do. Over the past 6 months I’ve changed up quite a bit in the way we film weddings. We’ve switched over to Sony and we are now using DaVinci Resolve to edit instead of Adobe Premiere. I feel like things have changed quite a bit. I’ve been able to do adjust our footage so much more than I use to, and I’m loving it! I have started to wonder though, is it the new cameras or the new program? 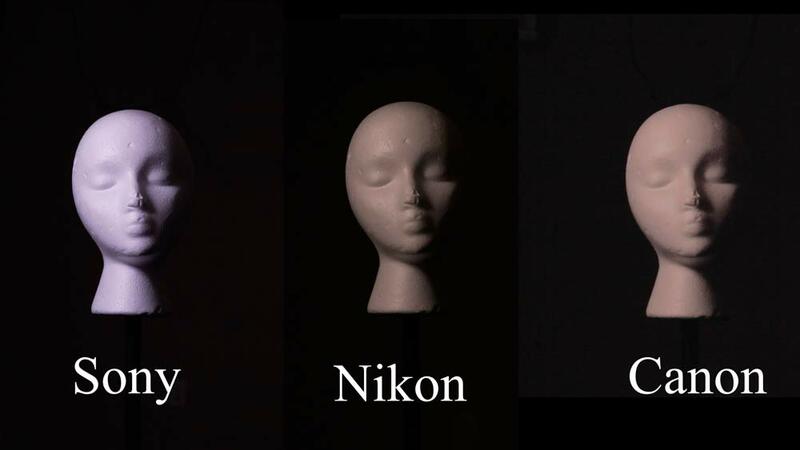 I decided to do a little test to compare video footage from Sony, Nikon, and Canon. I wanted to make things as clear as possible, so I made sure to run the tests as close as possible. First, I was going to film the same thing in the same situation. I put all the cameras in the same spot and didn’t change anything in the environment. Second, I set the cameras settings to the same white balance, shutter speed, and aperture. The only thing I adjusted was was ISO to put all the cameras at -1 exposure. I wanted to to be able to push all the cameras in post to see how the footage held up. It was really interesting how different each camera was. Some were at ISO 200 and the other around 800. The white balances were also very different as you can see from the first photo and the first part of the video. They were all set at 4000k but they look very different. I brought these into DaVinci Resolve and put them side by side. The first section of the video just shows how each one looked out of camera. I thought I had the exposure set lower for the Sony, but I guess I messed up somewhere. The next thing I did was I did a quick correct on the Sony video. It wasn’t perfect but I got the exposure closer and I adjusted the White Balance some. I then just copied and pasted the settings to the others to see how close it would be. It wasn’t. I kind of already knew that because the exposures weren’t the same and neither was the White Balance. I then set everything back to normal and went ahead and edited each video individually to try to make them match. I had to do different things for each clip. Some required the midtones be raised and others I added more contrast. In the end, I think I got them relatively close. Just from the quick test, it seems that a lot of the changes might have to do with the editing software we were using. The Canon video definitely didn’t hold up as well as the others, but this is a lower end Canon. I think I would have been able to do more with Canon in the past if I had used DaVinci. It’s always interesting to see what you’ll find out when you do a test. 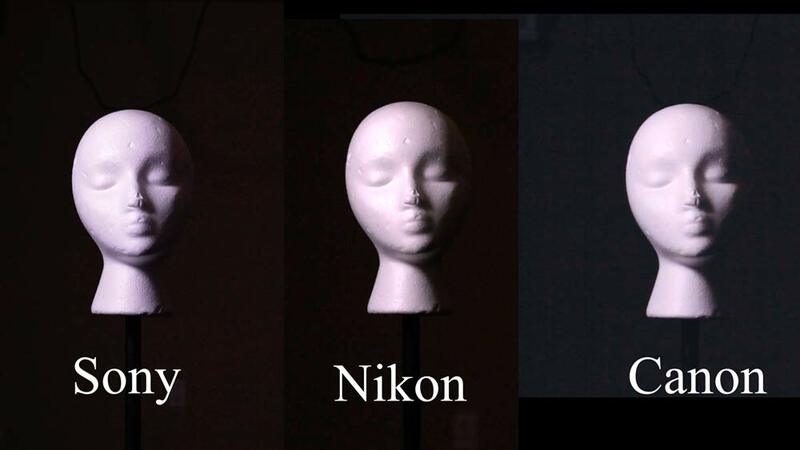 This test to compare video footage from Sony, Nikon, and Canon wasn’t perfect by any means, but I was surprised that the two non-Sony cameras held up as well as they did. I still think Sony is the easiest to edit and use out of the 3, but the other two weren’t as far behind as I thought. 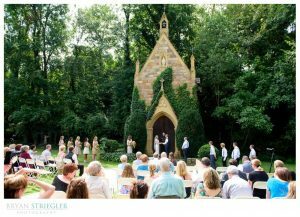 Should you get a Ceremony Video? Wedding videos have changed so much over the past 25 years. In the past videographers were really limited with the technology, and now videographers are more like filmmakers. Most of my couples are mainly interested in our cinematic wedding films, so should you get a ceremony video as well? 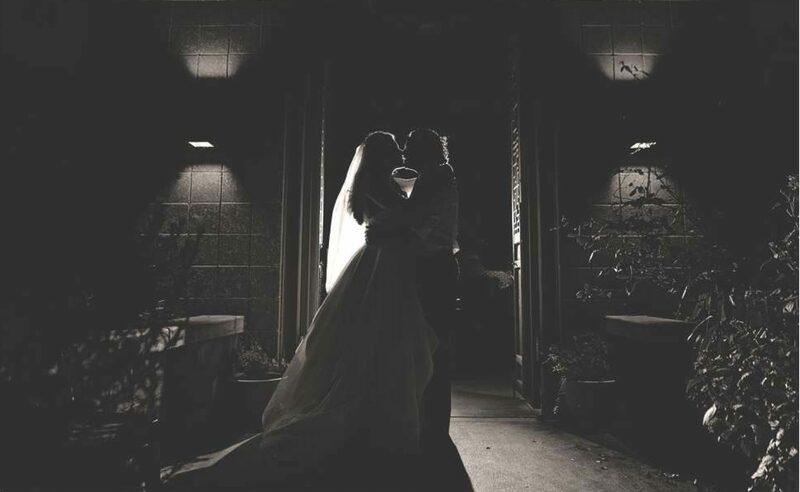 Our cinematic wedding films are a creative summary of the entire day. The great thing about that is the films are entertaining and cover pretty much everything that happened, but only a little piece of each event. A ceremony video gives you the entire ceremony from start to finish. Having the full ceremony gives you all the things that were said and happen. Most likely the cinematic film will only give you a few of these things. You might miss out on people walking down the aisle or certain parts of the vows. I know when I make cinematic films I have to cut some of these things out. Will anyone really watch a ceremony video though? More than you think. All of your friends might not want to watch it, but I’m sure your family members will. Ceremony videos aren’t as boring as most people think. In the past it was usually one angle and bad audio. 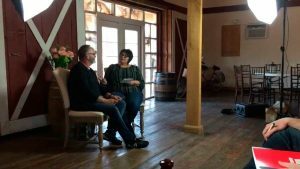 Now videographers will use multiple cameras and put a mic on the groom and officiant. I’m not sure about other videographers, but I go ahead and include the ceremony video in my collections. I’m going to record the whole thing so I can use it for the cinematic film anyway, so I might as well include it. 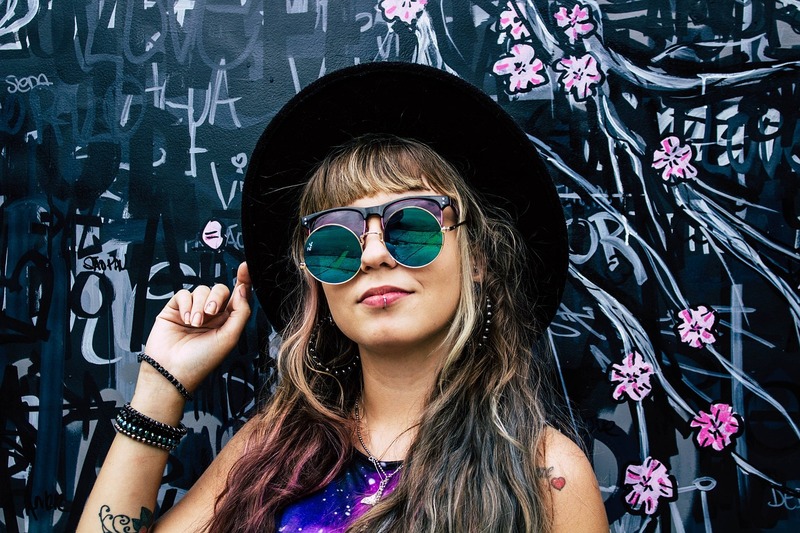 If your videographer doesn’t include it, you might ask how much they charge. It’s pretty easy to edit, so I hope it wouldn’t be much more. I love that people are finally realizing the importance of having a wedding film, but I also think a ceremony video is extremely important as well. It might not be as entertaining or artsy as the cinematic film, but it’s still an important part of the day that needs to be remembered. It’s been a good six months or so since we switched over from Canon to Sony, and it’s been a blast, but with all change, there is adjustment. At first I had to figure out all the new buttons, menus, and settings. I’m still working on that, but I feel like we’ve gotten things pretty close to perfect. My newest struggle is finding a Sony lens for the Sony A7sii. One of the immediate issues I had to deal with lenses was what to use and how. Sony is a different mount, so I had to figure out how to make them work. I’ve got a decent amount of Nikon and Canon glass, so I just bought adapters. The Nikon ones were a bit cheaper, and didn’t have any kind of electronic control. You change the aperture by twisting on the adapter. The Canon ones were more expensive but they did work electronically. That means I could change the aperture through the camera. The issue I’ve run into is that one of the Canon adapters is acting up. The camera will freeze up or it will stop adjusting the aperture. As far as I can tell, it’s only one of them, but it has made me very cautious in using them. I’ve thought about getting a cheaper non-electronic adapter, but I don’t think my Canon lenses will work with them because they don’t have the aperture ring. With all of that said, I’ve been looking into getting a Sony lens for the Sony A7sii. It would solve the issues with adapters, and it would also add in autofocus. 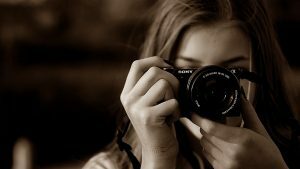 I don’t think I’d use the autofocus for video, but then it would open up the possibility of using it for photography as well. Sony doesn’t have nearly as many lenses out there as Nikon or Canon, so I’m a bit limited. The first thought was what focal length do I want? Do I want a zoom or a prime? 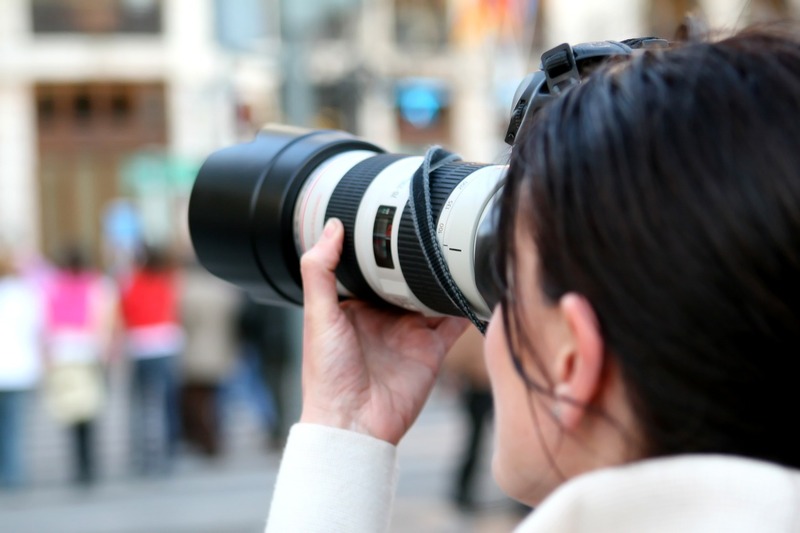 The majority of the zoom lenses were over $1200, so I’m leaning toward a prime lens. From there, I’m leaning toward a 50mm or something a little wider. I have a decent Canon 85mm and some Nikon 80-200mm lenses, so I don’t think I need anything on the longer spectrum. This has brought my list down to a few lenses. There’s a Sony 50mm f1.8, Sony 55mm f1.8, Sony 28mm f2, and the Rokinon 50mm f1.8. The cheapest out of these is the first one, the Sony 50mm 1.8. It’s only $200, but I’m not sure on the focusing ability. The reviews say the autofocus is slow. That doesn’t kill the deal because I’m mainly interested in the smoothness of the manual focus. The 55mm is easy to focus and supposed to be extremely sharp, but it’s close to a grand. In between all of that you have the other lenses. I’m really not sure which Sony Lens for the Sony A7sii I’ll go with. I really need to try each one out since I’ll mainly be using it for manual focus before I decide. Who knows, maybe I’ll just stick with what I have and make it work. I’ll make sure to write an update with any decisions I make. Shooting video is quite different than shooting photos. One interesting thing that I have to deal with at times is frame rate. This is how many frames are taken per second. Most movies shoot at 24 fps, and that’s what I will use at certain parts of the day. Other times I’m shooting at 60 fps, so I can slow down that footage later. Without getting too technical, there can be a problem with having too much light. Another general rule is that the shutter speed should be about double the frame rate. So if I’m shooting 24 fps, my shutter speed should be 48 (closest is 50) and if I’m at 60 fps, my shutter speed should be 120. To keep the shutter speed at this, I usually have to adjust some things like ISO and aperture. The problem I’ve run into though with my Mavic Pro Drone is that I can’t control everything, so the shutter speed usually jumps up to around 1000. This isn’t the biggest deal, but having a really high shutter speed with video can make everything look too stiff and choppy. Since I can’t change anything else, the only real way to fix this problem is to use ND filters. You can think of these as sunglasses for a camera. They go over the lens (your eyes) and make the light less intense. This will stop more of the light and I won’t have to raise my shutter speed. There are tons of options out there for ND filters for the Mavic Pro drone, and honestly, I couldn’t tell the difference between most of them. I ended up buying a cheaper set that had a good rating on Amazon. In the set, I got 4 different ND filters. I believe it was 4,8,16, and 32. The bigger the number the darker the filter and the less light can come through. I did a little test run with things this last weekend. I first took the Mavic Pro drone up without the ND filter. The shutter speed was around 1000 to get the exposure right. I then took it up with a ND 16 filter on it. This time, the shutter speed was around 100. That’s still a little higher than I wanted, but it’s so much better than 1000. When you look at the video hopefully you can see that things look a little different. Make sure to set the player to HD to get the best picture possible. When I watch it, I feel like I can see a difference. The non-ND video looks almost artificial. There’s something about it that doesn’t seem right. The other video looks smoother. The average person probably won’t notice a difference between the two videos, but I always want to make the best video I can. In the future, I’ll be using these ND filters for the Mavic Pro drone in my wedding films. Today I’m doing something interesting and a little different than the normal wedding films. Today I’m headed to Fort Smith to film several wedding vendors. I’m putting together an online webinar for brides to help them gain important information and make their planning go smoothly. Weddings can be confusing and stressful, so hopefully we will help out a lot of brides with these Free Wedding Planning Tips. The setup and the format is going to be pretty straight forward. There’s going to be two people talking: myself and the vendor. Each person will have a stationary camera and have a mic. The vendor will talk to the majority of the time, but I will do an introduction and ask questions. Basically the vendors are giving helpful hints related to their expertise and things they have seen go wrong. 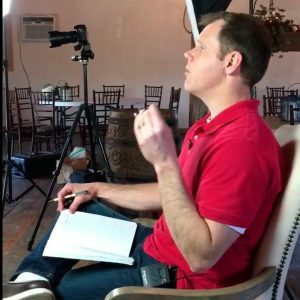 We have a photographer/videographer (myself), a venue (The Barn by Two Brothers), a florist (Expressions Flowers), a rental company (Tables Matter), and a DJ (Black Crown Weddings and Events). I love that we have so many different people so we can give free wedding planning tips that cover a variety of topics. This way we can help in more aspects of the wedding than say if we just talked about photography and videography. We’re shooting the majority of the videos today, but I’ll be shooting my own and the DJ’s video later. Then I’ll have to edit it all together and put together the site for all of it. I imagine we’ll be releasing it all within a month. If you’re planning a wedding or know someone that just got engaged, please share this information with them. These Free Wedding Planning Tips could really help them out and make their wedding awesome. The best part is that it’s all free, so they have nothing to lose. I’ll be posting more info about it when things are live, but I’ll also be adding a link back to this post, so make sure to check back or just reach out to me. A few days ago I wrote a post on the importance of getting a drone license. I really do believe that people need the training and the license to make sure they are being safe. Drones are capable of doing a lot of damage in just a few seconds. Since then, I have been studying for the Part 107 test. At first I was reading things on the FAA website and looking at random blogs, but I just felt confused and wasn’t learning anything. That’s when I started looking for a paid course. 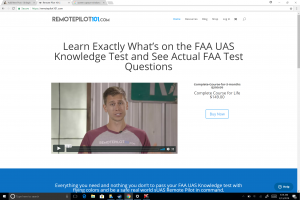 I found a few different options, but I ended up going with the Remotepilot101 Drone Training Course. The first question you probably want to know and what I thought of too is “How much?” I care about passing this test and all, but there’s no way I’m spending $1000 on a training course. 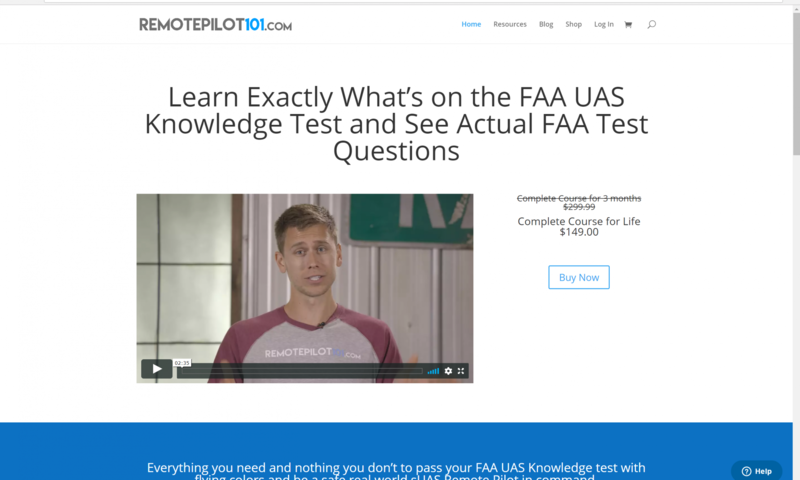 The great news is that the Remotepilot101 course is extremely affordable. I believe I spent around $120, but now it’s $150. This is a one time fee as well. Once you buy the course you have it for life and you get the updates. There are some places that give you a course for a limited time or expect you to pay an upgrade; not this one! The next big question for me was the training format. When I was looking at the different options out there, I found that they were quite different. Some had digital flash cards and videos with just words and no audio. These would probably work, but I found them boring. The Remotepilot101 course has a real person talking to you and also showing you slides and maps as he talks. Jason (the presenter) has a great personality and really explains things in a simple way. I find myself enjoying these videos and learning a lot. At the end of each Lesson, there’s a quiz, so you can check your understanding and have something to study quickly later. I just finished Lesson 2 last night, and I feel like I’ve learned so much in a small amount of time. I couldn’t imagine trying to pass this test without this resource or especially trying to fly my drone without this information. 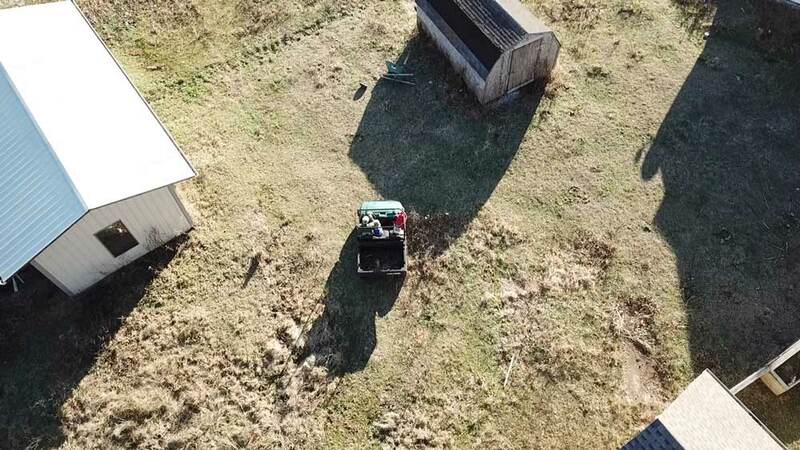 I’ve still got 7 lessons left in the Remotepilot101 Drone Training Course, and when I’m done, I’ll be able to easily pass the Part 107 exam and be a capable and safe drone pilot.